Memories of talented and respected musicians of mature years continuing to perform despite their declining abilities haunts me. I would not be as presumptuous as to suggest that as a writer I am either talented or respected, but the fear of continuing past my sell-by date has prompted a decision to stand back from blogging. The transformation of classical music from art to entertainment is now almost complete, so, to quote a Moody Blues lyric, "I've said my piece and I'll leave it all up to you". There are many other reasons contributing to my decision. Inevitable change means micro-social media such as Facebook and Twitter are now the standard for online communication; unfortunately, I have no aptitude for these platforms and no enthusiasm for the relentless self-promotion required to generate and retain an audience on them. Additionally, writing long-form posts that are tolerably literate and accurate is very time consuming, and the fragmentation of posting and commenting across multiple platforms has added to that workload. But, above all, in recent months the enjoyment of blogging has diminished, and I suspect that if this is the case for the author, it is also the case for the reader. It would be precipitative to bring On An Overgrown Path to a complete halt at this moment. I have some adventurous travel planned and will confine occasional future posts to my exoteric and esoteric journeys. 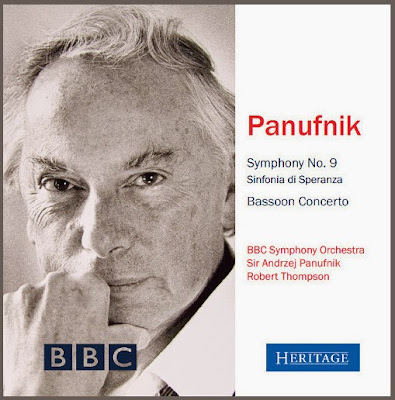 We are currently enjoying glorious spring weather in Norfolk and this morning I was walking under the dazzling East Anglia sky listening to the re-issue of Andrzej Panufnik's radiant Ninth Symphony, Sinfonia di Speranza seen above. Let us hope that an enterprising record label (Brilliant Classics or Naxos perhaps?) records or licenses a complete cycle of Panufnik's ten symphonies for release at an affordable price. Because if we all spent more time listening to music like this and less time on our computers and smartphones, the world would be a very much better place.